With short legs and a long body, the Dachshund stands out. This distinct appearance has led the breed to be referred to by many as weenie dog or sausage dog. Good humored owners often choose a name related to sausage products. Frank, Dodger, Oscar, Mayer, and Vienna are a few of the more common sausage related dog names. The Dachshund was bred to hunt badgers and other small prey. A couple of badger names from literature include Brock (from the graphic novel ‘Fables’), Digger (from the stories of ‘Thornton Burgess’), and Boomer (a character in the children’s magazine ‘Ranger Rick’). A few badger name ideas from television are Furrow (from ‘Garfield and Friends’), Tuck (from Disney’s cartoon version of ‘Robin Hood’), and Clive (a lawyer from ‘Fantastic Mr. Fox’). Mascot badger names include Urbie (The Wildlife Trusts), Howie (Calgary Roughnecks), and Billy (Fulham Football Club). The modern Dachshund is a derivative of German breeders and also a common symbol of Germany. 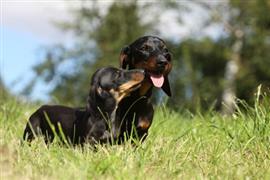 Some popular German dog names for the breed include Kaiser, Dackel, Teckel, and Katrin. Some of our pages will contain a subcategory. A subcategory is a slightly more specific grouping than the main topic of the page. For a subcategory, we will include a separated table of names and corresponding descriptions. An example of a subcategory of Red Dog Names would be 'Dog Names Inspired by Red Wines'. If you have any subcategory ideas for the Dachshund Names page, we would love to hear them. Use the form below to submit your ideas.